Daniel Protheroe was, in his day, one of the most important and popular Welsh musicians working in America and in Wales. Born and raised in Ystradgynlais in the Swansea Valley, he became a recognised leader of Welsh music in the United States of America, as well as a major contributor to music-making in Wales. A prolific composer, over a thousand copyrights of mixed genre works were lodged for him at the Library of Congress, without counting the works published in Wales, such as for male voice choir, hymns and songs for children. The majority of his published works are in the archives of the Library of Congress in Washington D.C. with some of his personal papers and manuscripts in the collection of the National Library of Wales, Aberystwyth. At age nineteen, Daniel Protheroe emigrated from ‘Yr Ystrad’ and settled in Scranton, Pennsylvania, the then epicentre of Welsh-America. Unlike so many who went to Scranton, Daniel Protheroe did not become a miner, iron worker or labourer, but immediately established a successful career as an international musician – as a conductor, educator, adjudicator, singer, author, and most importantly, as a composer. Among Daniel Protheroe’s early teachers in Wales were Philip Thomas, J T Rees, Dr Joseph Parry, Dyfed Lewis, Rev. William Fairhurst and Rev. G. Emery, and in America, J. W. Parson Price, Dudley Buck and Hugo Kahn. In 1893 he gained his Mus. Bac. (Toronto), and in 1903 his Doctor of Music from New York University. He became a Naturalized American Citizen in 1893. He was awarded honorary doctorates from the University of Toronto, Coe College, Iowa, and the University of Wales. Daniel Protheroe’s life and works fall into four periods: Ystradgynlais (-1886), Scranton, Pennsylvania (1886-94), Milwaukee, Wisconsin (1894-1908) and Chicago, Illinois (1908-1934). While in Scranton, he founded and conducted the Cymmrodorion Choral Society with over two hundred and fifty Welsh choristers. 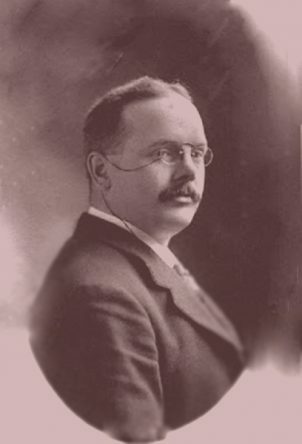 The choir won the second prize at the International Eisteddfod of the Chicago World’s Fair in 1893, and Daniel Protheroe was the first person in Scranton to stage and conduct an oratorio (Alexander’s Feast by Handel) with an orchestra. It was in Scranton that he met and married his wife, Hannah Harris. An experienced ‘eisteddfodwr’, Daniel Protheroe won the alto solo at age seven (Swansea) and at 18 conducted the Ystradgynlais Choir at the National in Llandeilo. In the years between 1900 and 1933, he crossed the Atlantic nine times to adjudicate at National Eisteddfodau and conducted the Festival choir at the one in Harlech in 1933. In the USA, he adjudicated at all five American National Eisteddfodau, the Pittsburgh International Eisteddfod and many regionals across the country. Protheroe was much in demand across the Continent as a Cymanfa Ganu conductor and many of these frequently would involve congregations numbering in the thousands – in Scranton in 1926 there were more than 6000 singers at the city’s Armoury. And also, for the National American Eisteddfod Cymanfaoedd Canu. Educator: He was a faculty member of the vocal department of the Sherwood Music School, and Director of the music department of the Chicago Training School, a Methodist institution for the training of missionaries and church workers. Pedagogy: He authored the Harmony Course, and a Choral Conducting course to address the needs of the growing number of choirs in the United States. Although he lived outside of Wales for most of his life, Daniel Protheroe passionately maintained his first language, often praised for his ability both to write and deliver adjudications from the ‘llwyfan’ of the National Eisteddfod in impeccable Welsh. Today, he is probably best remembered for his hymns. As a regular traveller, many of his most popular hymns are named for places, such as Milwaukee, Wilkesbarre, Cwmgiedd, and others like Price, Hiraeth and Hannah. ‘Cân a Mawl’ is a bilingual Welsh-English hymnal that he edited for the Calvinistic Methodist Church of America. Daniel Protheroe died in Chicago in 1934, and both he and his wife, Hannah are buried in Scranton, Pennsylvania. At the time of his death, special remembrance services and concerts were held across the Welsh communities of America. At the National Eisteddfod Cymanfa Ganu in Neath that year, his hymn-tune, Price, was sung in his memory. Diolch i Mari Morgan am gyfrannu at y dudalen hon. Daniel Protheroe's manuscripts are held at the National Library of Wales. Please visit the database of their collection here. Mae llawysgrifau Daniel Protheroe o fewn casgliad Llyfrgell Genedlaethol Cymru. Ewch i chwilio'u bas data yma. NEW AWARD: ‘Dr. Daniel Protheroe Award for Hymn Writing’ to launch at the North American Festival of Wales, 2019. The North American Festival of Wales (NAFOW) launches a new award in honour of Daniel Protheroe. The first of an annual award to be given for the writing of a new hymn-tune and words. A panel of distinguished writers and musicians will adjudicate the competition and entries to be submitted under a nom-de-plume. The winners will be announced during the afternoon session of the NAFOW 2019 Cymanfa Ganu in Milwaukee, WI. The winning hymn will be performed by the Festival Chorus for all to hear and enjoy. GWOBR NEWYDD: ‘Gwobr Dr Daniel Protheroe am Ysgrifennu Emyn’ i lansio yn yr Ŵyl Cymru Gogledd America, 2019. Mae Gŵyl Cymru Gogledd America, 2019 (The North American Festival of Wales - NAFOW) yn lansio gwobr newydd er mwyn dathlu Daniel Protheroe. Y cyntaf o wobr flynyddol i’w roi am ysgrifennu emyn-dôn a geiriau newydd. Bydd panel o sgrifennwyr a chyfansoddwyr nodedig yn barnu’r gystadleuaeth a bydd yr ymgeision o dan ffugenw. Bydd yr enillwyr yn cael ei cyhoeddi yn sesiwn prynhawn y Cymanfa Ganu NAFOW 2019 yn Milwaukee, WI. The winners will be announced during the afternoon session of the NAFOW 2019 Cymanfa Ganu yn Milwaukee, WI. Bydd Corws yr Ŵyl yn perfformio’r emyn llwyddiannus er mwyn i bawb glywed a mwynhau. In Milwaukee and across Wisconsin he conducted numerous choirs, including the First Baptist Church Choir, the Union Christian Choir, the Orpheus Society of Racine, and the Lyric Glee Club of Sheboygan, and was the director of the Arion Music Club. Success followed success, and Chicago called in 1903 when Daniel Protheroe was appointed Director of Music of the famous Central Church on Michigan Avenue, with its team of charismatic ministers; a role he would maintain until his death. 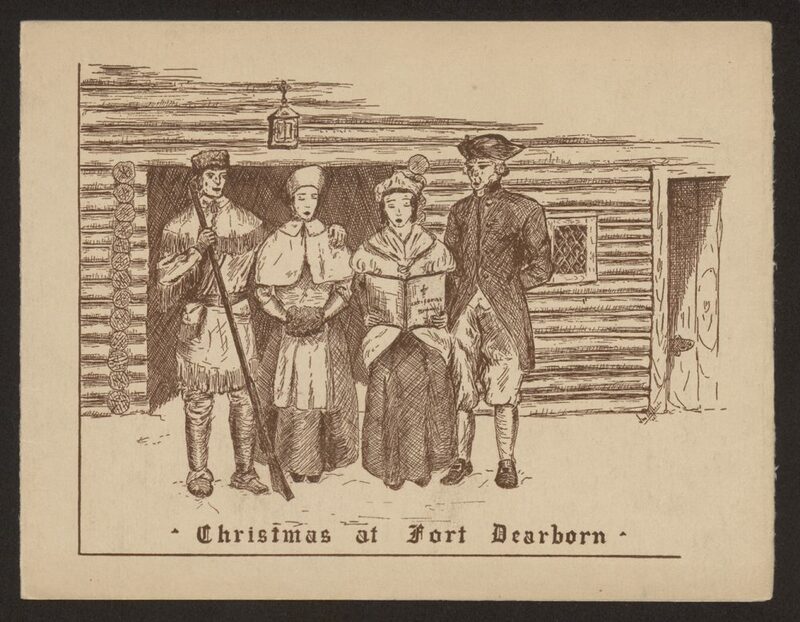 It was for the Christmas service at Central Church that he would write his yearly carol then forming the basis of his legendary Christmas card, complete with original artwork. These were sent to his friends and family across the United States, and at home in Wales. These examples are from the Tŷ Cerdd Archive, which is held at the at the National Library of Wales, Aberystwyth. During the Chicago period, he also conducted numerous choirs, including the Illinois Bell Telephone Men’s Chorus and Women’s Chorus, the Daily News Choral Society, the Sherwood Glee Club, the Chicago Training School Chorus, and the Chicago Children’s Chorus. In 1926 he founded the Chicago Welsh Male Voice Choir and gave concerts at the city’s iconic Orchestra Hall, regularly broadcasting live, nationwide, during the early days of radio. 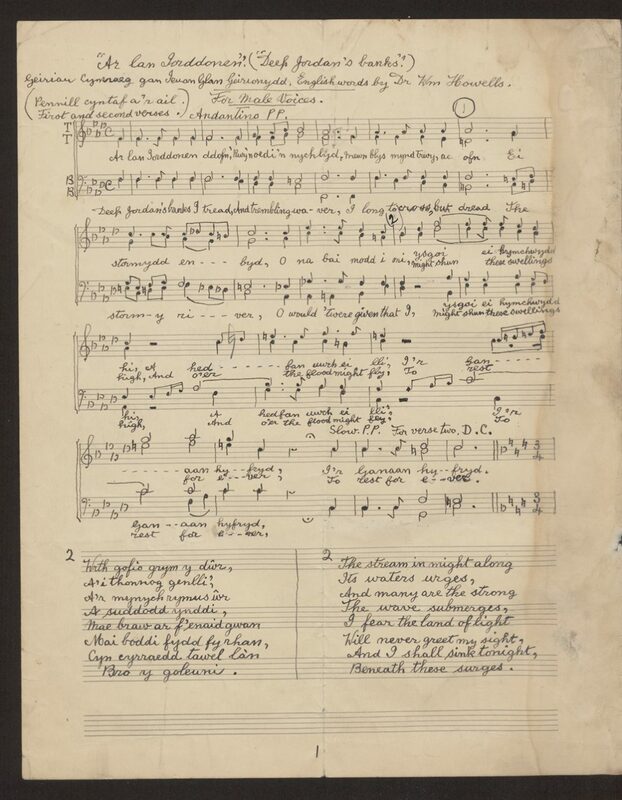 The manuscript displayed here is Ar Lan Iorddonen – a setting of words by Ieuan Glan Geirionydd for male voice choir. Daniel Protheroe was a prolific Welsh American composer, though many of his works have not stood the test of time, possibly because they were not published in Wales. Of those that are known are the male voice choruses of The Crusaders, Nidaros, Castilla, and his arrangement Laudamus (Bryn Calfaria by William Owen) are cornerstones of the repertoire. For female voices there are his arrangements of Welsh folk songs, and the simple beauty of the two-part song with words of Psalm 46 (v 4&5), Y Mae Afon. The cantata Saint Peter, The Garden and the Sepulchre, and a symphonic poem In the Cambrian Hills, the Quartet in A major and the violin solo A Welsh Romance are all worth noting. 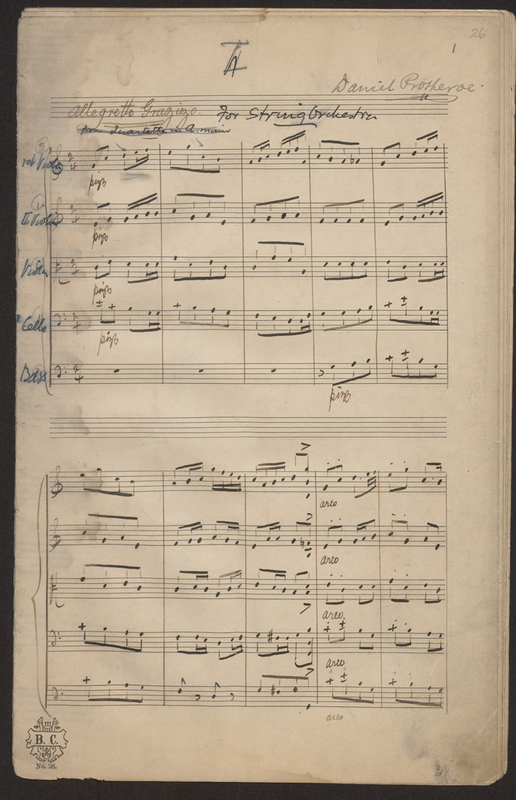 The gallery on this page displays the beginning of an untitled work for string orchestra as well as the early sketches for a choral work, Y Tymhorau.